Nothing anyone says will prepare a newcomer for the acoustic of the Concertgebouw. This was my first visit, and I hope it will be the first of many. (There will certainly be at least one more, a second Brahms concert.) I shall not try to describe the sound, suffice to say that it must be the warmest, most rounded I have heard, with the possible exception of the very different Musikverein. Such things come to naught without musical excellence, of course, but once again a visit abroad, or even out of London, makes one realise how unfortunate we are in terms of orchestral-size concert halls. It was a chamber orchestra we heard on this occasion, not a small chamber orchestra, but one of what I should think of as Mozartian proportions, with a string section extending down from twelve first violins to four double basses. (Not, I hasten to add, that Mozart cannot sound wonderful with a larger orchestra!) Before hearing this concert, I should have been something of a sceptic concerning chamber-orchestral Brahms. Doubtless the warmth of the acoustic played its part, but so did the crack players of the Chamber Orchestra of Europe. There was not a single occasion during the Double Concerto when I wished for a larger orchestra, much as I should have loved to hear the Royal Concertgebouw Orchestra on home territory. (Next time, maybe!) I have heard wonderful things about the COE’s recent, quite intensive collaboration with Bernard Haitink, but again, one has to hear these things for oneself. Joined by the Capuçon brothers, there was here a sense of that celebrated line from Die Meistersinger, perhaps as close as Brahms and Wagner ever came: ‘Es klang so alt und war doch so neu!’ Haitink imparted the wisdom of an old Meister, of course, and yet there was nothing remotely stuffy, pedantic, or set in its ways, to his interpretation. The COE sounded just as invigorated as he did, lifting itself to something different from an orthodox symphony orchestra, but equally different, or perhaps more so, from the small-scale nature of what has come to be thought of as chamber-orchestral playing, the twin intimacy and intensity that seem to be taken as read from an Abbado-founded orchestra being equally present even many years on. And the violinist and cellist brought both youthful vitality and a true sense of old-world style. Truly, then, this appeared to offer the best of all possible worlds. Gautier Capuçon’s opening phrase resounded with a depth that set the scene for the rest of the performance. This was actually the only occasion on which I heard a little intonational slip, but it mattered not a jot, Beckmessers will be alarmed to note. Naturally it was Gautier who made the greater impression at first, simply on account of Brahms’s writing, but the sweetness of Renaud’s violin tone was soon an equal wonder to savour; likewise his perfectly judged portamenti. Rubato and tempo variations, both in the first movement and later on, were never confused; Haitink knew what he was doing, never exaggerated, but let the music speak for itself, an illusion (Wahn) perhaps, but when a latter-day Sachs is conducting, all the better for it. The grand scale of that first movement made its point in a personal yet not idiosyncratic manner. It was not granitic; if anything, it seemed to have the mark of a master Wagnerian upon it. Haitink’s perhaps surprisingly Romantic view of Brahms was not that of, say, his great Amsterdam predecessor, Willem Mengelberg. It was marked rather by a freshness – many thanks here to the superlative COE woodwind – that took inspiration from Mendelssohn and Schumann, without reducing Brahms to the status, as it were, of a late early Romantic. The slow movement was heard as if a song sung in a single breath. Again Schumann and Mendelssohn sprang to mind. All sorts of duets, trios, quartets, etc. were to be heard, as the soloists conversed with their orchestral counterparts. I could not help but think of Così fan tutte. Indeed, it was possible to imagine Fiordiligi and Dorabella playing games as they chose – what an impossible task! – between the blond player and his dark brother. The finale seemed ‘right’ in every respect. It had the character of a finale: perhaps an obvious point, yet it is hardly to be taken for granted. Not for the first time, we heard the shadow, productive rather than forbidding, of Beethoven – and not least in the combinations of harmony, rhythm, and colour, again especially with respect to the woodwind. This was musical, not artificial, excitement, every participant seeming to draw out the best from everyone else. A truly outstanding performance, the best I have ever heard of this work. Had it not been for that performance, I doubt that I should have had any qualms whatsoever about that of the First Symphony. Any reasonable person would not, and this was by any standards again a masterly reading. Of the four Brahms symphonies, this one took the longest for me to ‘get’: not in the sense of arrogantly assuming to understand it, but for me not simply to be bemused by it. Some people – more than you might expect – would claim that the fault lay with the composer; cue turning round Brahms’s notorious reference to ‘boa constrictors’ and the form of Bruckner’s symphonies. They would be wrong. It was doubtless partly a matter of my own immaturity, but also, I think, a matter of waiting for the right performance to come along, since this symphony suffers especially with respect to conductors who do not comprehend its tightly-knit organisation. (It stands at least as close as the Fourth to Schoenberg, indeed, if anything, closer.) Hearing within close succession Daniel Barenboim conduct the work with the Staatskapelle Berlin and then Furtwängler on record marked my eureka moment a good few years ago. Haitink’s account with the COE was only the second I have heard that made sense of the work, the first having been Barenboim’s. That in itself ought to be commendation enough. And indeed it possessed many of the virtues of the concerto performance. Throughout there was a strong sense of line – strong enough, indeed, that I wondered what the problem could ever have been held to be with the work. The first movement’s introduction led as naturally as could be into the exposition proper; tension never sagged. Brahms’s two inner movements evoked both kinship and difference – and, most importantly of all, progression, as did the four movements as a whole. The woodwind section proved as verdant as previously. And if there were a few occasions when I felt a pang of regret that there were not more strings, this Mozartian complement worked wonders and never sounded in the slightest bit stretched, their tone in general as glowing as the acoustic – insofar as one could make such a distinction. The conductor’s refusal, or better disinclination, to linger in the Andante sostenuto was no sign of brusqueness, nor of unwillingness to yield; but it brought the music closer to a Schumannesque intermezzo than one often hears, a reading perhaps especially valid for a chamber orchestra. Schubert was heard to be just as much Brahms’s progenitor – that Harmoniemusik! – as Bruckner’s in the third movement. Haitink’s unwavering yet subtly flexible sense of line guided the twists and turns of the finale. ‘That’ theme was lovingly, faithfully, yet individually connected to Beethoven, and there was triumph in the final arrival. And yet… I retained a lingering doubt, alongside wholehearted admiration for Haitink’s sureness of touch. Had it perhaps sounded a little too easy, too comprehensible? Barenboim, I seemed to remember, had exulted in the very difficulty of Brahms; his reading had stood closer to Schoenberg’s ‘Brahms the Progressive’. Certainly there had been more metaphysical striving, and a darker, more ‘German’ tone to his great orchestra. Rank ingratitude, of course; this was a noble, dignified, in many ways revelatory account. Yet one cannot have it all; Brahms’s symphonies are greater than any one interpretation will ever permit. So maybe the ‘problem’, not really a problem at all but an opportunity, a provocation even, lay partly with Brahms after all. Poor Weber: opera companies, especially in England, do him anything but proud. And then, at least in the case of Euryanthe and Oberon, there is the matter of the dreadful libretti he had to set – presumably part of the reason why companies are unwilling to perform them. (Oddly, dreadful music seems to be less of a problem, given the lashings endured of Donizetti, Verdi, et al.) The best one can say for Helmina von Chezy’s efforts in Euryanthe is that they are merely awful, as opposed to the execrable text for Oberon. Lucky Weber, then, to receive such a fine performance as this from the valiant forces of the Chelsea Opera Group. Die jemals auf der Welt erhört!’ Burns’s handling of Weber’s score was perhaps all the more revelatory, not least since it is about the music that, perforce, we truly care. Line was maintained throughout. Not a single passage sounded unduly hurried or remotely meandering. The Overture was an interesting case in point. It offered quite a contrast with, say, Karajan’s account, firmly melded into an almost granitic Wagnerian whole as it is – and mightily, even wondrously, impressive. Here, however, we heard a greater variety of moods, textures, and tempi, arguably more faithful to the movement’s role as a potpourri introduction to Weber’s opera (as opposed to Karajan’s concert overture) and to the composer’s conception, without danger of lapsing into the merely sectional. Presentiments – one has to remind oneself that they are not echoes! – of Mendelssohn characterised the very opening, but a darker form of the supernatural made its voice eerily heard in the ghost music. Weber’s musico-dramatic experiments were communicated with apparent ease, boundaries blurred but not obliterated between more old-fashioned set pieces and the ‘forward-looking’ – at least to any self-respecting Wagnerian – treatment of recitative and arioso. Above all, dramatic tension remained tight and proportions simply sounded ‘right’, a far more difficult task to accomplish than many might appreciate. Kirstin Sharpin’s star shone brightly in the tight role, words and music honoured to equal extent and indeed in fine alchemy. Hers was a portrayal both impassioned and noble, clearly longing to be properly ‘on stage’, yet offering considerable dramatic compensation even in concert. Sharpin’s cleanness of vocal line and dramatic commitment were shared by Camilla Roberts’s Eglantine. Tricky coloratura apparently evoked no fears; more importantly, such ambiguity as the libretto permitted was exploited to its dramatic fullest. Stephen Gadd likewise offered a finely honed portrayal of her accomplice, Lysiart, malevolent and sophisticated – again, insofar as the libretto permitted, but considerably more so than one would have likely have expected. Jonathan Stoughton revealed an often pleasing tenor as Adolar, drawing upon lyric and heroic reserves as required. This is clearly a voice which, if sensibly marshalled, will be in great demand for heroic roles; however, more careful phrasing was sometimes called for on this occasion. Richard Wiegold projected a benevolent voice of experience as the king, and Melinda Hughes’s brief appearance as the country girl, Bertha proved full of charm. All contributed to a performance that was very much more than the sum of its parts. Now will one of our opera companies – ideally, the Royal Opera – kindly take its cue and do its duty by Weber? What an imaginative programme – and, moreover, what a finely-performed programme, from Maxim Rysanov and friends! Four of Bach’s cello works (or, if you must, viola da gamba for two of them): two solo, one, performed ‘straight’, one transcribed for viola, and two of those with keyboard performed as trio sonatas. My only gripe might have related to my unfashionable preference for the piano, but that is not in any sense a reflection upon Iain Farrington’s alert harpsichord continuo. The C major Cello Suite was performed first, by Kristina Blaumane. Her tempi were well-considered; even if I initially thought the Courante a little on the fast side, I was soon persuaded. The performance was certainly not rigid. Rubato was applied, yet never in exaggerated fashion; moreover, there was a nice lilt to Bach’s rhythms. Each dance was well characterised, leading to a properly climactic yet never uncharacteristic Gigue, in which Blaumane dug deep into her strings. Hers was a rich tone, applied sensitively throughout. The cello and piano (or, if you prefer, gamba and harpsichord) sonata, BWV 1027, followed. My ears took a minute or two to adjust to the new sound world of violin, viola, cello, and harpsichord, but I was swiftly won over. Interestingly, it was Rysanov’s viola, though not in any sense performed in allegedly ‘period’ style, which offered the most audible link with the older viola da gamba. Rysanov is, of course, an excellent violis, but more importantly, an excellent musician. I had the sense, rightly or wrongly, that these performances were somehow ‘his’ – and I for one was grateful for that. The opening Adagio was courtly in character, though it was here that textural busyness most stood out: more, I suspect, of needing time to adjust to the new forces than anything else, though I did wonder whether the harpsichord contribution might have been a little more restrained. A lively yet sturdy second movement ensued, properly based upon a sound understanding of rhythm and harmonic rhythm. The opening of the Andante I was a little less sure about: Dmitri Sitkovetsky’s violin tone was oddly low on vibrato, making for a glassy impression. Fortunately, it thawed, though we might still have benefited from a little less parsimony in that respect. The finale offered a wonderful display of contrapuntal ingenuity, putting me in mind of that to the Sixth Brandenburg Concerto. Rysanov opened the second half with the D major suite, albeit for viola. His was a much easier platform manner than Blaumane’s; indeed, the way he launched into the opening Prélude could not help but take an audience with him. He offered a similar lilt and rubato to the cellist, but with a more brilliant – though certainly never glossy – tone, which again also managed to evoke in the best way resonances of older instruments: history refracted, considered, rather than misunderstood as antiquarianism. (Do the purveyors of so-called ‘Historically Informed Performance’ realise how little they know of the complexity of the philosophy of history? A little Hegel, Marx, and Croce, let alone more recent writing, should be sent their way forthwith.) It was interesting, if perhaps not surprising, to hear just how different Bach’s music sounded on viola, perhaps as distant here from the cello as from the violin, yet quite how readily it was born anew, the first Gavotte being the only case – though I am not entirely sure why – when I was less convinced by the adaptation. Rysanov offered such an array of character, whether with respect to different note values or to different dances, that the choice of instrument seemed beside the point. Repeated sections were never merely ‘repeated’, yet the difference – that word again – never sounded as if it were for its own sake, as exhibitionism; it was built rather upon solid musical understanding, at times drawing one in to moments of quite breathtaking intimacy. There was wit too, the Courante definitely making me smile at its suavity. The closing Gigue, even with an occasional intonational slip, proved wonderfully captivating, indeed almost Bartók-like in its always-musical excitement. My ears had no problems then in adjusting back to the trio sonata set-up for the Sonata, BWV 1029, which sounded as if it had always been conceived for such forces. Its opening Vivace was imbued with an irresistible sense of life, likewise the closing Allegro, most definitely a finale in spirit. The intervening Adagio was again slightly the victim of Sitkovetsky’s odd withdrawal of vibrato. (It is not as if that were how he played the rest of the time.) Nor was I terribly enthusiastic about Farrington’s re-employment of the lute stop. But those were ultimately minor points, given a performance in which all concerned communicated Bach’s musical argument with such sympathy. The patron saint of musicians (pictured, courtesy of Raphael) has found herself especially favoured by English composers. One of the greatest odes to her is that by Handel, that greatest of honorary Englishmen, to a text by Dryden. (If only we heard more of his oratorios and choral works, and somewhat less of his operas: fine music but, more often than not, dramatically uninvolving.) The finest recording I know of Handel’s 1739 Ode for St Cecilia’s Day is conducted by today’s centenary birthday boy, Benjamin Britten, at what I think - though I shall be happily corrected - was the celebratory opening concert of the Queen Elizabeth Hall in 1967. Alas, I cannot find an excerpt on Youtube or another such site, so here instead is a refreshing performance of the glorious final chorus, ‘As from the power of sacred lays,’ from a young Tuscan choir and orchestra. 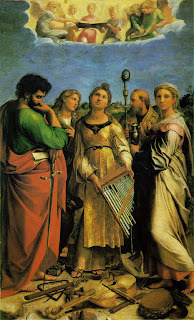 The Italianate charm of the younger Handel’s music never left his work, and how refreshing it is to come across musicians being able to treat it as music, rather than as a pseudo-archaeological exercise replete with inspectors and enforcers from the non-vibrato Taliban. Handel’s work, in this and many other cases, owed a great deal to Purcell, perhaps the greatest English composer of all. Certainly no composer, not even Britten, has set the English language with greater facility. The late Sir Charles Mackerras’s joyous recording of Purcell’s 1692 Hail! Bright Cecilia has never been equalled, let alone surpassed, though Sir Michael Tippett’s earlier recording offers a splendidly characterful alternative. Amazon links to all three of recordings may be found below. I had greatly been looking forward to my first opportunity to hear Maxim Vengerov live. Sadly, the reality proved somewhat disappointing. It is not that there was not in many respects a good deal to admire; this was no catastrophe, nor indeed anything remotely akin to that. However, I came away thinking that the concert itself had been somewhat ill-conceived, and that that had led to a number of more immediate performing shortcomings. First, the programme transpired to be as imbalanced in practice as it had appeared on paper. To have two Mozart violin concertos in one half was odd, but doubtless could have been made to work in an outstanding performance. To have a second ‘half’, though – in reality, more akin to a final ‘third’ – which comprised three slight, encore-style pieces by Tchaikovsky really did not make any sense at all. Would it not have made for a more balanced, if still not especially revealing, programme to have had Mozart and Tchaikovsky in both halves? Vengerov has devoted a considerable amount of time in recent years to conducting; indeed, he will, as part of the Barbican’s Artist Spotlight, conduct Rimsky-Korsakov’s Scheherazade later in the season. On this occasion, though, and especially in the Mozart works, it was difficult to avoid the conclusion that he would have been better served by having a separate conductor. The Fourth Violin Concerto opened promisingly, Vengerov noticeably attentive to the need to elicit a variegated sound and textures from the players of the Polish Chamber Orchestra. However, once he began to play, the players were largely left to fend for themselves. Acting as soloist and conductor is an enormously difficult task, and in reality, few musicians prove fully equal to it. (Daniel Barenboim would be an obvious example; at this stage in his career, having someone to conduct him in Mozart would most likely prove superfluous. Brahms, though, would be another matter.) The Mozart that emerged, in both works, proved somewhat on the bland side: pleasant enough, but alas, that is not nearly enough. There are certainly, contrary to the strange claim made by Richard Wigmore in his programme note, darker undercurrents in these works, which demand the performers’ – and the audience’s – attention. The D major concerto’s slow movement sang sweetly, but the Rondeau seemed to run out of steam, sounding rhapsodic rather than full of integrated contrasts. A firmer hand at the helm would surely have helped. Perhaps what most surprised, though, were the occasional passages in which Vengerov’s intonation was at odds with the orchestra’s, or indeed, in the first-movement cadenza, with what he had just played. A similar pattern was followed in the A major concerto. Vigour arrived at last in the ‘Turkish’ section of the finale, but given the listless quality of what surrounded it, sounded more incongruous than anything else. The Polish players were generally excellent, sectional leaders in particular, but at least in this hall, a larger body of strings (we had 7.6.4.4.2) would often have been welcome. Throughout, I could not help but contrast the performance with the Mozart we had heard recently across the road in Milton Court, from the Royal Northern Sinfonia and Thomas Zehetmair. Then, every phrase, every note, had been invested with life, with meaning; Mozart had scintillated and beguiled in equal measure, even when I might in the abstract have queried Zehetmair’s tempi. Vengerov is not yet, at least, a soloist-director of that calibre, and Mozart requires no less. I could not help but wonder whether Vengerov had imbibed too much of Tchaikovsky’s view of Mozart as all sweetness and light, a nineteenth-century confectioner’s view of a composer whose true essence is fathomless profundity, however lightly worn at times. That might have made at least for a programming idea: a concert, for instance, including Tchaikovsky’s Fourth Orchestral Suite, ‘Mozartiana’. The collection of three pieces we heard, though undoubtedly more stylish, did not add up to more than the sum of its parts. There were wonderful touches, for instance of portamento, never overdone, and there were virtuoso fireworks to be savoured, for those who care for such things. The latter were despatched with the aplomb one would have expected, though elsewhere, intonational problems occasionally resurfaced. The central Souvenir d’un lieu cher, here orchestrated for strings by David Walter, was charming and well-proportioned in performance, yet the Sérénade mélancolique emerged, despite the idiomatic if somewhat small-scale string sound, as meandering and longwinded. In that respect, the fault is probably Tchaikovsky’s. Vengerov’s admirers, and they clearly remain numerous, went wild following the Valse scherzo, which at least was not inflated into something that it is not. It was difficult, though, not to ask whether they would have have reacted similarly, irrespective of what they had heard. A concert, then, more for fans of the violinist then for Mozartians. You may recall I sent you an email offering a renovated 2 bedroom property on Sloane Avenue, Chelsea, SW3 with a long lease. The property went under offer immediately at the asking price of £899,950 because it was cheap. However 6 weeks later, the purchaser has not proceeded. As you may be aware, the London market has moved 10% last month alone (click link). The Chelsea property now looks very very cheap at £899,950 and my Managing Director is going to increase the price next week to £999,950 to meet the market and sell the property in the UK. However, he has agreed to allow me to send this offer to you and a handful of clients at the original price of £899,950 – subject to a reasonably quick decision. This is equivalent to a £100,000 discount and the irony is that our stock is selling quicker in London than it is in Hong Kong and for more money. There is an opportunity to purchase a cheap property with easy terms - a property that would sell in London for close to £1,000,000. We’ve been dealing with some time – this has only gone to a few people and I thought that on a personal level it genuinely might be something for you. Is there anything I can do to get you across the line for a relatively quick decision – I’ll make the cashflow work and I’ll fit in with your timing. If there is some interest, send me a note back or call / SMS on [...] and I’ll send you a link to the website, which includes a walk through video, photographs, floor plans, and location of the property. Thank you very much for your message: perhaps in the final reckoning a little peremptory, given the lack of either salutation or introduction, yet admirably anxious for my financial welfare. I confess to slight bemusement as to why you might have written to me concerning this property, ‘beautifully refurbished’, or otherwise; I certainly do not ‘recall’ your having written to me before, but better late than never, I suppose. Whilst it would, I am sure, be delightful in many respects – bar, perhaps the neighbours – to live in Chelsea, it is, alas, in good part on account of organisations such as yours and the people with whom you more generally deal that so few people actually in need of somewhere to live in London find themselves able so much as to find the meanest of pillows upon which to rest their weary heads. Being neither an intrepid ‘wealth creator’ nor the worthily well-born recipient of inherited wealth, I fear that you may find it simply too much of a challenge to ‘make the cashflow work for me’. That said, I appreciate your concern, your desire to address things ‘on a personal level’, and indeed your selfless offer to help ‘get … [me] across the line’, something with which I have not been offered assistance since school sports day. I should like to respond in kind by asking you in turn a few questions, ‘on a personal level’. Do you and your colleagues ever trouble your heads with the consequences of the obscenely wealthy using housing as a parasitical ‘investment’, unproductively enriching themselves and thereby further impoverishing the rest of us? Do you consider such, and your aiding and abetting thereof, to be a morally acceptable practice? If so, upon what grounds? Do you so much as contemplate the implications of describing an £899,950 price for a two-bedroomed-flat – admittedly one more bedroom than I could ever hope to rent – as ‘very very cheap’? Do you worry about the contradictions of a late-capitalist society in which that might prove a remotely plausible statement, and the blood that may ultimately be spilled when those contradictions become still greater? ‘On a personal level’, I do hope so, and likewise hope that, if such a statement of housing ‘value’ should no longer surprise, then it will at least continue or even begin to shock. That I say for the sake not only of your immortal soul, but also for that of humanity as a whole. You may or may not ‘recall’ my reply in a few months’ time; however, if you do, I hope that it will be because you have decided to devote your working life to something more socially useful, or at the least less pernicious. It would not, I can assure you, be difficult to find something falling under such generous rubric. Who knows? You might just feel liberated, grateful even, at the discovery of a social conscience. I await in turn Mr Chan's response. Wagner Rescued from the Opera House? ‘The most admirable twin-genius of musical composition and dramatic poetry. Add to that the fact that he is at the same time the dramatist, decorator, machinist, copyist, Kapellmeister, and schoolmaster par excellence when it concerns his own works, and tell me if he has not in him the stuff of some Indian god with any number of heads and hands.’ Thus did Liszt describe Wagner in a letter written 180 years ago, when Wagner was still formulating his Ring project. The praise might have been yet more fulsome, though nevertheless accurate, even understated, had Liszt been writing in the aftermath of the Ring and Bayreuth. The multivalent nature of Wagner’s achievement is part both of what attracts us to him and what makes our efforts to deal with him an extreme case of Beckett’s imperative to ‘fail better’. This issue covers a number of Liszt’s divine bases, and alerts us moreover to ways, some of which Wagner might never have imagined, in which we might consider his life, work and legacy. David Cormack tells a fascinating episode from London theatrical history; Laurence Dreyfus looks at Wagner as musical storyteller in Parsifal; an unusual interdisciplinary approach, even by Wagnerian standards, is brought to bear on Wotan’s eye by Michael Trimble, Dale Hesdorffer and Robert Letellier. Reviews consider Wagner performances, live and recorded, ranging from his city of birth, Leipzig, through a city of exile, Zurich, to the ever-contested festival theatre he constructed at Bayreuth. But it is the seriousness, readily yet rarely successfully parodied, of Wagner’s vision for musical drama that arguably offers his greatest legacy; a truer appreciation of the Gesamtkunstwerk, if we must call it that, extends beyond the merely agglomerative. In that respect, as the bicentenary year draws to a close, we stand as Wagner’s heirs – which musical dramatist of any note has not felt his influence, if only, Stravinsky-like, to rebel against it? – and as the ready target of his rebuke. Wagner’s fulminations against the musical and theatrical practices of his time seem as relevant as when he penned them; so does the alternative he offered, not just in volumes of theory, but in his series of dramas. Pierre Boulez, not only one of Wagner’s great interpreters, but also his successor as composer, conductor and educator, thus extolled him for having loathed a system in which ‘opera houses are […] like cafés where […] you can hear waiters calling out their orders: “One Carmen! And one Walküre! And one Rigoletto!”’ Not for nothing did Boulez, in a celebrated interview with Der Spiegel, echo Wagner’s prescribed ‘fire-cure’ for Paris and the concluding conflagration of Götterdämmerung, suggesting that the ‘most elegant solution’ might be to ‘blow the opera houses into the air’. Wagner’s works, then, have continued to declare their incompatibility with existing conventions and norms. Maybe it is time once again for us to consider whether they belong in the opera house at all; if they do, it is undoubtedly more as critic, not only of opera’s practices, but of those of late capitalism at large, than as the comforting, ritualistic repertory pieces to which ‘Wagnerians’ would reduce them. Twenty-four years after his 1989 Wigmore Hall recital debut with Gérard Wyss, Wolfgang bade farewell – at least as a recitalist, though other appearances are not ruled out – to the venue with a programme of Schubert songs to texts by Johann Mayrhofer. (Richard Stokes’s otherwise exemplary programme note fell strangely silent upon the relationship between Schubert and Mayrhofer, surely a matter for discussion in a programme such as this, saying no more than that they ‘shared lodgings’. Maynard Solomon’s article, ‘Franz Schubert and the Peacocks of Benvenuto Cellini’, published in the year of Holzmair’s Wigmore debut, might at least have been mentioned, if only to dispute its suggestions, likewise Susan Youens’s response. But let us leave that on one side for the moment.) It was only fitting that Holzmair’s recital partner should be Imogen Cooper, their series of performances and recordings having been rightly celebrated for much of the period in which Holzmair has been performing – and, as Holzmair pointed out, in a modest response to the Hall’s closing presentation, he has been professionally performing Lieder for a period half as long again as that which he has in London: quite a career, by any standards. It was a splendidly non-crowd-pleasing programme, one in which attention to text, both musical and verbal, was exemplary throughout, and a moving opportunity once again to hear both that unmistakeably Austrian way with words and that unmistakeable voice, in which a baritone’s range is so tinged with the timbre of a silvery tenor that one has to remind oneself that Holzmair is not actually a tenor. The second Heliopolis song opened the programme: a performance that seemed to begin in medias res, no warming up here. Both Holzmair and Cooper imparted a vigour, even a fire, that impressed in itself, fitted Mayrhofer’s wish that passions seething in brazen harmony (‘Laß die Leidenschaften sausen im metallenen Accord’), and augured well for what was to come. Even in a slow-moving song such as Philoktet, both musicians knew how to impart a winning, echt-Schubertian lilt, for instance to Holzmair’s ‘Unterhalt’, relief from the loneliness of Philoctetes without his bow. Atys was a particular highlight of the first group, a performance possessed of a particularly fine sense of narrative. The ghostliness with which the quotation in the final stanza was delivered chilled, and yet developed into a fuller bitterness as that stanza progressed, a fine preparation for the dark harmonies offered by the rock-solid harmonic foundation for Cooper’s journey to Hades in the following song. Ghostliness and lilt found themselves in perfect equipoise in Der zürnenden Diana. It seemed fitting that in, Am Strome, which opened the second group of songs, the beauty of youth was recaptured in both voice and, implicitly by recollection, in the text: a heart-rending moment that led, in the song’s second and third stanzas, into the voice of experience, again both in terms of work and performance. A group of water-based songs – by the river, fishing, on the Danube, and the boatman – relished yet never exaggerated Schubert’s essentially Romantic yet city-bound love for the natural world. A darker side was, of course, always present, yet never forbiddingly so: ‘Untergang’, the destruction with which Auf der Donau closed, was desolate enough, yet neither Holzmair nor Cooper felt any need to exaggerate. The song spoke, or seemed to speak, for itself, art concealing art. The second half opened with the extraordinary Einsamkeit, almost cantata-like, not only in its length but also its shifting moods, a fine challenge, expertly navigated, for a farewell recital. Cooper’s voicing of Schubert’s chords was an object lesson in the art, harmonic rhythm thereby propelling the musical argument. ‘Gib mir das Glück der Geselligkeit!’ Likewise the quasi-orchestral quality to the piano part upon the suggestion of riding into battle: ‘Reitet in die Schlacht hinein.’ Give me the good fortune of conviviality: whatever form(s), twists, and turns, the historical relationship of Schubert and Mayrhofer may have taken, one knew here that it was something not to be taken lightly, and yet at the same time not unduly to be laboured. Sociability offered its own message for the recital as a whole: as it were, a gathering of friends, a Schubertiade, united in the ‘Liebe’ of which the poet spoke. The following starry nights (Die Sternennächte) were simply lovely – or, better lieblich, as Webern, one of Schubert’s most avid successors, once marked one of his truly Viennese piano pieces. Cooper’s exquisite horn calls in Trost and straining towards Liszt in the following Lied eines Schiffers an die Dioskuren offered excellent examples of picturesque ‘moments’ that were yet integrated into a convincing whole. The patent sincerity of both musicians shone through especially strongly in the latter song’s final stanza, parting the ocean’s waves, before the Auflösung of the final song, which followed without a break. ‘… störe nimmer die süßen ætherischen Chöre!’ Well, who in his right mind would wish to disturb those sweet, æthereal choirs? On either side of the presentation we were treated to an encore, the second, Wolf’s Mörike Fußreise both welcome and tantalising: like the recital as a whole. As ever, the problem with the world’s greatest music festival – and we should remember that it is not only a music festival – is knowing where to begin; or, alternatively, to what we might narrow down our choices. Opera, of course, looms large. Last year saw Così fan tutte open the new Mozart-Da Ponte cycle, which is progressing, or regressing, in reverse order. Christoph Eschenbach, Sven-Eric Bechtolf, and the Vienna Philharmonic renew their collaboration in Don Giovanni: notoriously a director’s graveyard. It remains to be seen whether Bechtolf will rise above the curse; in my theatrical experience, only Calixto Bieito and Graham Vick have done so, and even then, not entirely without ambiguity. But at this year’s press conference at the Austrian Ambassador’s Residence, he certainly spoke eloquently about the challenges involved; it was heartening to hear Kierkegaard invoked, and equally heartening to hear Mozart’s drama giocoso being treated seriously as drama. We shall see – and hear… A splendid cast includes Ildebrando d’Arcangelo, Luca Pisaroni, Gneia Kühmeier, and Andrew Staples. The hundred-and-fiftieth anniversary of Strauss’s birth brings a new Rosenkavalier. Robert Carsen’s previous staging was quite the best I have seen. Now we shall be treated to something for which I had feared I might be too late: a new production by Harry Kupfer. Zubin Mehta will conduct a cast including Krassimira Stoyanova, Sophie Koch, Mojca Erdmann, and Günther Groissböck. Strauss also features heavily in the orchestral repertoire, being treated to performances by Eva-Maria Westbroek, the Philharmonia, and Christoph von Dohnányi (Four Last Songs, with Bruckner’s Ninth Symphony); Don Quixote (the Philharmonia again, under Esa-Pekka Salonen, with Berg and Ravel); Ein Heldenleben (Concertgebouw/Jansons); Tod und Verklärung and Also sprach Zarathustra (VPO/Dudamel, along with René Staar’s new work, Time Recycling); Metamorphosen (Gringolts Quartet and friends); and songs from Thomas Hampson and Wolfram Rieger. Memories of a Vienna – and Europe – on the brink of war also connect with another Festival theme, the anniversary of the outbreak of the Great War in 1914. Christopher Clark, one of my esteemed former supervisors, will deliver an opening lecture. (Those who do not know his book on the origins and outbreak of war, The Sleepwalkers: How Europe went to War in 1914, are urged to rectify that omission as soon as possible. Never again will they think that Germany’s was the only blank cheque issued during the July Crisis.) That context also explains the presence of Berg (Op.6) and Ravel’s La Valse in the aforementioned Philharmonia/Salonen concert. Marc-André Dalbavie’s Charlotte Salomon will receive its world premiere, directed by Luc Bondy, with the composer himself conducting the Salzburg Mozarteum Orchestra. Barbara Hönigmann’s libretto takes its leave from Charlotte Salomon’s Leben? Oder Theater?, in which the artist, who fled to southern France following Kristallnacht, tells of how she came to paint hundreds of gouaches, a semi-fictional retelling of the story of her life and that of her family, a ‘Singespiel’ (Salomon’s own term) now to be seen in the Jewish Historical Museum in Amsterdam. Dalbavie’s music will also feature prominently in the Festival’s ‘Salzburg Contemporary’ series, as will that of Wolfgang Rihm. Cornelius Meister will conduct the Vienna RSO in Dalbavie’s La Source d’un regard and Sonnets for counter-tenor and orchestra; the Klangforum Wien under Ilan Volkov will perform, alongside music by Stravinsky, Murail, and Debussy, Dalbavie’s Palimpseste and Melodia; the Gringolts Quartet give his String Quartet; and the Mozarteum Orchestra under Eschenbach offer, in between Haydn and Beethoven, the Flute Concerto and the Suite for Cello and Orchestra. Rihm offerings include Christian Gerhaher and Gerold Huber in a selection from the Goethe-Lieder and Harzreise im Winter, as well as some of Schubert’s Goethe-settings; Will Sound More, and Gejagte Form, together with Nono’s Guai ai gelidi mostri from Klangforum Wien under Sylvain Cambreling; and orchestral music from both Eschenbach (the Piano Concerto’s world premiere, with Tzimon Barto) and Jansons (Lichtes Spiel). Schubert opera gains an all-too-rare outing with Fierrabras. Nikolaus Harnoncourt had originally been intended to conduct; he is replaced by Ingo Metzmacher, with Peter Stein directing. Daniele Gatti and Alvis Hermanis – previously director of Die Soldaten and Gawain – collaborate in Il trovatore, with a cast including Anna Netrebko, Marie-Nicole Lemieux, and the up-and-coming baritone, Plácido Domingo. La Cenerentola with Cecilia Bartoli will transfer from ‘her’ Whitsun Festival; Damina Michieletto directs, whilst Jan-Christophe Spinosi conducts his period-instrument Ensemble Matheus. Donizetti’s La favourite is given in concert by Elina Garanča, Juan Diego Floréz, Nello Santi, et al. And a ‘Projekt Tristan und Isolde’ offers Wagner’s Handlung, or at least its Prelude, Second Act, and Isolde’s Verklärung, from the West-Eastern Divan Orchestra and Daniel Barenboim, sung by Waltraud Meier, Ekaterina Gubanova, Peter Seiffert, René Pape, and Stephan Rügamer. The opening celebration of sacred music (broadly construed), ‘Ouverture Spirituelle’ continues, this year turning its extra-European focus towards Islam, Sufi songs being presented by Al-Tariqa al-Gazouila, led by Sheikh Salem Algazouly, in the Fischer von Erlach Kollegienkirche. Haydn’s Creation, with the Bavarian Radio Symphony Orchestra under Bernard Haitink opens the entire festival. An absolute must should it all hover upon the horizons of possibility! Other concerts include two from the English Baroque Soloists and John Eliot Gardiner: Monteverdi’s Vespers and a 1685 trio of Bach, Handel, and Domenico Scarlatti; Mozart, symphonic and sacred, from Manfred Honeck; the final three Mozart symphonies from Harnoncourt and Concentus musicus Wien, intended to illustrate Harnoncourt’s latest theory that the three works form a single, wordless oratorio; the first book of the Well-tempered Clavier from Pierre-Laurent Aimard; and, intriguingly, Reger’s Requiem coupled with Bruckner’s Fourth Symphony (Domingo/VPO/Barenboim). Bruckner is the recipient of an entire symphonic cycle, succeeding Mahler last year. (And no, the cycle does not include the interminable variety of ‘versions’…) In addition to those conductors already mentioned, we shall hear from Riccardo Chailly (8th), Haitink (5th), Philippe Jordan (2nd,with the Te Deum), Meister (1st), Riccardo Muti (6th), and Daniele Gatti (3rd). The VPO plays in some, though not all, of those concerts. Other concerts include the regular series of Mozart Matinées, three concerts from the Camerata Salzburg (a particularly inviting one being Mendelssohn, John Casken, and Mozart, with Thomas Zehetmair); and the usual embarrassment of riches from visiting orchestras and recital soloists, instrumental and vocal. Fans of Rudolf Buchbinder will be treated to a complete cycle of the Beethoven pianosonatas. Highlights for me would include the Academy of St Martin in the Fields and Murray Perahia (Stravinsky, Haydn, and Beethoven); a recital of solider songs from different eras (Anna Prohaska/Eric Schneider); Schubert and Brahms Lieder from Anja Harteros and Wolfram Rieger; piano recitals from Grigory Sokolov and Maurizio Pollini; and, last but certainly not least, a recital (Penderecki, Mozart, Previn, and Beethoven) from Anne-Sophie Mutter and Lambert Orkis. As I said at the beginning. Salzburg is not entirely music, however, and there is a strong line-up of ‘straight’ theatre too. Hugo von Hofmannsthal’s Jedermann appears, as it does every year, in its guise as Festival mystery-play. The First World War theme is picked up by Karl Kraus’s Die letzten Tage der Menschheit, with members of Vienna’s Burgtheater ensemble. Other offerings include The Forbidden Zone, a multi-media production from Katie Mitchell and Duncan Macmillan, looking at the war through a number of women’s personal experiences; a dramatization of the 1913-15 bestseller, Gustav Meyrink’s Golem; and four productions from the Festival’s Young Directors Project. There is more, of course, much more; for further information on spoken drama, opera, and concerts, please visit the Festival website.